Park Inn offered a me free stay in exchange for this review. Park Inn by Radisson opened in May 2017 after seemingly being under construction for ages. I travel up and down that road often and it was nice to constantly see the progress, little by little. When the coat of paint finally went on I was a bit surprised by the colours, but now that I’ve been inside the hotel and grasped their concept, the exterior is perfectly fitting. The interior of the hotel is decorated with bold colours and a lot of splashes of fun. From the Congolese wooden bikes on the wall in the lobby to the oversized yellow lamps to the giant green chairs, Park Inn has really gone all out to make an impression. More importantly, the best impression on arrival comes from the staff who give a very warm welcome as soon as you walk in the door. Check-in was a breeze and only took a few minutes. There are only a couple of desks so I’m not sure what happens when a large group walks in all at once but, for me, I was in my room in a matter of minutes after friendly, hassle-free service. It’s to the standard I’d have expected for a Radisson (not that I stay in fancy places a lot… but I can use my imagination!) and the warm welcome and quick check-in were both great initial signs of the care they taken to train their staff well. Everyone is friendly and attentive from the moment you step up to security at the front door to the moment you check out and you feel feel like you’re a valued guest. I was treated to a suite for my night at Park Inn which was very fancy and spacious. If you’re in town to do business and want a space that would work for meeting with people, the suite has a guest bathroom, couches, a TV, and a great work table plus tea and coffee on one side and the bedroom area on the other. The bedroom side of things is lush with a huge bed, fluffy pillows, another TV, a giant bathroom complete with a bathtub and two sinks, a comfy chair, and a desk. If you don’t need a giant room, their standard twin and double rooms are just as well-equipped, comfy, and beautiful. I usually find myself slumming it when I travel, staying at cheaper places so when I saw the room, I almost didn’t know what to do with myself! It didn’t take long to settle in and I soon found myself watching Wimbledon while lounging on the bed and then pouring myself a bath. Afterwards, I settled in for awhile at their great desk with a hot chocolate and got some work done using their fast wifi while trying not to be too distracted by the great fifth floor view. 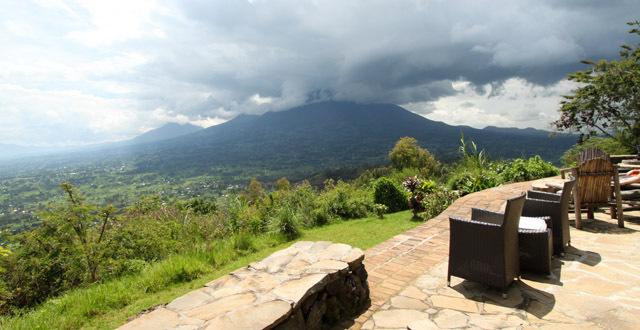 Kigali really is a beautiful city and Park Inn has a wonderful panoramic view of the city from the Kiyovu hill. It’s especially nice at night where you have a nice view across to the Convention Centre. This is a small thing but I love that the air conditioner is easy to use (as in, easy to turn off) and that the windows open because Kigali is one of the few places in the world that really doesn’t need climate control. I hate being in stuffy hotels where you’re a prisoner of sealed windows. If air con is your thing, great! You’ll have that option. But for the rest of us who like the actual outdoors, we have window freedom! The rooms are bright and airy and I also loved hearing the bubble of the fountain below. According to their website rooms start at $112, but the reality is that the price of the rooms depends on a few factors like the time of year and how busy the hotel is. I’m told that you can be sure that the lowest rate available will be on their website so head over and have a search. If you manage to get a rate close to the $112, it’s a total steal when you compare this hotel to the pretenders in Kigali who have the gall to charge $100 for very mediocre rooms and zero amenities. Hotel rooms in Kigali have long been way over priced for what you get so it’s great to see such a big player on the international scene come in with a competitive price that really is amazing value for what you get. Even at a much higher price you’re going to feel like you’re getting a great bargain. So what do you get? Well, for starters, the hotel is spotless and beautiful. Rooms are airy, the beds are comfy, and everything just works. There’s tea, coffee, and hot chocolate and a kettle in the room. The showers are great and some rooms even have baths. The TV has almost 30 channels in case you want to lay in bed and see what’s on. They have a brand new and well-equipped gym with a sauna and steam room plus a great pool that has a bar area beside it in case you just want to relax. Breakfast is included, there’s a nice lobby bar and a restaurant with great food, and they even have a nightclub on site and it’s tucked away under the hotel so there’s no chance of being kept awake. There’s a safe in your room and to top it all off, the wifi is very fast and it works in all of the rooms and down in the lobby and restaurant as well, if you fancy a change of scenery. Breakfast is included in your stay and they put on a fantastic spread that goes until 10am. There’s a selection of yummy, fried meaty things and you can add to your hot breakfast by ordering scrambled eggs or an omelette and a grilled tomato. They’ll also make waffles to order, if that’s more your thing. They’ve got a great selection of delicious bread, cold meats and cheese, fresh juice, great coffee, a choice of serial and muesli (that you can top up with walnuts and other goodies), fresh fruit, and yoghurt. It’s a great spread and you’ll find something to keep you happy, even after staying for several nights. The on site restaurant is of a very high caliber and the dishes I tried were very good. 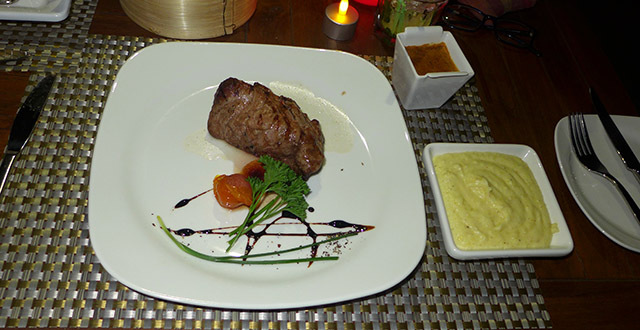 The steak with peppercorn sauce (Rwf 13,500) was a great cut of meat and very well-prepared. I had a pretty mean mojito as well. My one complaint about the dinner meal is that the outside patio is so dark, I couldn’t actually see what I was eating. I’m ok with low lighting but it’s a bit extreme out there and it would be nice to see them get just a bit more lighting either on the table or around the outside of the patio to illuminate things just a bit more so you can see what’s going into your mouth. The next day I had a Caprese sandwich with mozzarella, tomato, and pesto (Rwf 8,000) which was good, though they originally got the order wrong in the kitchen and made a totally different sandwich. So maybe the restaurant needs a little fine-tuning but it’s great to see that the waitress handled the mistake very gracefully and efficiently and I had what I ordered soon after. Most importantly, I’ve finally found a decent piece of cheesecake in Kigali! 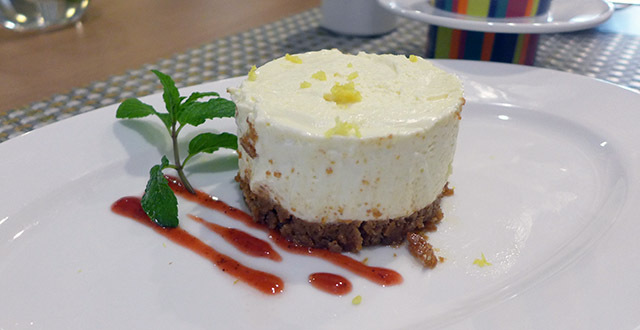 Their American style cheesecake (Rwf 5,500) is seriously good and you should order it immediately. It’s gigantic though so go with a friend. There are so many new hotels springing up these days and Park Inn by Radisson really is an exciting addition to to the city. The restaurant is open to everyone and does very good food at decent prices and the gym (Rwf 8,000 per visit including the pool) and pool (Rwf 5,000) are also open to non-guests and are well-priced when you compare them to other hotels of the same standard. Plus the wifi is very fast and open to anyone who wants to come hang out in the hotel lobby, at the bar, or dine at the restaurant. Head over to Park Inn and take a look around! Or if you have guests coming to town or fancy a staycation of your own, I can totally recommend it for a really nice stay!